Experience Luxor day trip from Hurghada to visit the most famous archaeological sites in Upper Egypt, joining a private Egyptologist tour guide. Visit Valley of the Kings to discover more than 63 tombs, enjoy witnessing the ancient Egyptian temples of Queen Hatshepsut, Karnak temple, Colossi of Memnon, then have your lunch on the Nile, then return back to your hotel in Hurghada by a private air-conditioned car. Book Now! Valley of the Kings, the final resting place of Egypt’s rulers from the 18th to the 20th dynasty, it is home to tombs including the great Pharaoh King Ramses II and boy Pharaoh King Tutankhamen. The tombs were well stocked with all the material goods a ruler might need in the next world. Most of the decoration inside the tombs still well preserved. Finally, end your Luxor day trip from Hurghada by transferring you back to your hotel in Hurghada by a private air-conditioned vehicle. Fantastic trip. Very full day, lots to see. Well worth a trip to Luxor from Hurghada. Although the road trip is long it is worth the effort as the Temples at Karnak are simply awesome and the Valley of the Kings is not to be missed. Great day out and worth getting a private tour to make the most of it. We also had a river boat ride and lunch in a good restaurant in Luxor. Take a hat and lots of water! It was our first visit to Egypt and and it was amazing with breathtaking structures and historic places. One of the highlights was the trip to Luxor which was amazing with a professional tour guide Mr Marian. She was well informed about Egyptian history and gave us many insights to the tombs and the places we visited. Kudos to Egypt Tour Portals for the well managed trip. We had a wonderful day trip in Luxor with the amazing guide Marian who is awsome, really nice, very intelligent and has many interesting stories about Luxor and the ancient times. Many thanks to her!! Nermeen was a wonderful tour guide. We really enjoyed the visit, and she sure does know most of the history. Thanks. We booked a trip from Sahl Hasheesh to Luxor with Egypt Tours Portal. From the inquiry about tour, which we pre-arranged from the Netherlands, until the drop off at our hotel, it has been a perfect experience. The tour operator of Egypt Tours Portal, Ahmad, was very quick in replying and proposed a perfect itinerary for us, including a visit to the Valley of the Kings and Hatshepsut Temple, a short boat trip on the Nile with lunch in a restaurant on the shore of the Nile, and a visit to Karnak Temple. The driver picked us up and dropped us off exactly according to schedule, and skillfully managed the Egyptian traffic. Most compliments, however, go to our Tour guide, Nirmeen. Educated in Egyptology and highly experienced as a tour guide across Egypt, she not only is extremely knowledgeable about ancient Egyptian history, religion, language and architecture, she also is able to tailor the tour exactly according to your personal interests and preferences. Perhaps even more important though, Nirmeen is very friendly and sociable, and fun to spend the day with. Would highly recommend Egypt Tours Portal in general, and our tour guide Nirmeen in particular. Highly recommend Nermine from Egypt Tours Portal. She’s wonderful! Very very knowledgeable and more than happy to answer all of our questions. She was also very accommodating to our interests and varying degrees of stamina. Great way to spend the day in the Luxor area. i booked the Day Excursion before leaving Florida, and from the inquiry about it to final Confirmation it Took only 20 minutes. The day of Excursion, the driver was right on time to pick us up from our hotel in El Gouna (5am) and it has been very professional and polite! Our Tour Guide, Marian, was superb!! Definitely it’s a Tour i recommend to anyone who likes ancient History, you will be blown away, and if you’d like to request a tour Guide, with Marian you can’t go wrong!! Very long day and tiring, but worth every second! We did a private day tour to Luxor from Sahl Hasheesh (hurghada). It started at 5h30 and finished around 20h00. It’s a long day in the heat and sun, but we knew it was going to be like that and tried to be prepared. The driver Mohammed was very good, quick, and funny. He explained to us many things during the drive when we were passing in villages. The guide Abdul (Abdelrahman) was very polite and did a very good job explaining the story of the pharaohs and everything we were seeing. He spoke very good English with a British/Australian accent. Make sure you cover your heads because my wife and I got huge headaches from the sun. We left a little earlier because of that. We went to Luxor, the Valley of the Kings etc for the day with our guide MarieAnne. She was absolutely fabulous, really warm and friendly and certainly knew her stuff. We asked loads of questions, which she answered – it wasn’t a case of someone reading off a script – you could tell she was really enthusiastic about what she was telling us. The places we visited were absolutely amazing. We did Cairo and the Pyramids too with another company – while that was amazing, we both preferred the sites and history on this one. It feels very safe, everyone is friendly. You don’t get much hassle when you’re with a guide. We did stop as a stone merchants for a free drink, which was interesting and we bought something, but it’s worth noting the merchandise is cheaper from the street sellers which we realised after. We had a really comfortable car (not mini van) for the two of us and MarieAnne also bought us a few drinks when we met her in Luxor. The driver was brilliant, the driving out there is a bit chaotic, but we felt very safe. We even got caught in a sandstorm on the way home and the driver was calm and capable. The boat ride to lunch was lovely, and the food was really good too. Soup, bread, dips and then a choice of chicken or fish main course. Would definitely recommend! We arrived in Luxor at approx 10am where we met our tour guide Marion, the first thing she said to us was “what would you like to drink from the local shop”, after a 5hour journey with 1 20 minute stop, that was a vey welcome question. We went from this point directly to the valley of the kings, a 10 minute drive. Once inside the valley we had lots of time to look around, you have a number of tombs to enter but your ticket only allows you to go into 3, they’re all pretty much the same but splendid all the same. We had to pay extra to go into king tuts tomb, no photos are allowed in here by the way. My mind wandered as we retraced the steps of Howard Carter although the decent to the tomb is on wooden boards. The tomb itself is tiny compared to the other s in the valley, and as you enter the tomb itself, the kings body is there in a temperature controlled glass box with just his head and feet showing. Theres also a casket in its original place to the right side, as this is where he would have been on discovery. As you climb back up the wooden stairs to leave, take a look through the slats in the stairs, you can see and touch the original steps of the tomb. From the valley our guide took us to the alabaster factory, I’ve seen these being made before so i didn’t go inside this particular one, my 2 sons came out having purchased 2 beautiful scenes, (the largest one got broken in 2 in the suitcase coming home)! From here it was off to Hatshepsuts temple, again lots of time and tons of information given. A little boat ride along the Nile to Banana island for lunch, which was delicious, then back across the nile to Karnak Temple, absolutely fascinating stuff, me and my wife have done this tour 2 years ago and we were still in awe of the scale and history surrounding this place. After here it was time to say goodbye, but not before having a refreshing drink of sugar cane juice, bought from a side street in luxe, this drink is very sweet but gives you that energy kick thats so desperately needed after all the walking. 17800 steps recorded for the day!!!!! We dropped our guide where she joined us at the monuments of Colossi of Memmnon. A very very enjoyable day with a lovely Tour guide she was very kind and knowledgeable we had many questions and she answered them all really well. The only down side to the trip was the journey from the hotel to Luxor and Back. A 5.30am collection and a long 4 hour journey down some VERY uneven roads, if you have a problem with your back then this trip is not for you. We arrived back to our hotel just in time to get something to eat. Our previous trip to Luxor was from Sharm by Air, far more comfortable. Very good trip. Early rise because it was a 4 hour journey. The driver, Hassan was excellent catering for our every need on the drive to Luxor. We met Ahmed and drove directly to the Valley of the Kings where the history of the Kings was explained and we visited the tombs of Ramasis II, III and IV. We were taken to a local craft village and saw the handcrafted goods being made. We then went on to the Queens temple, Hatshepsut, and given a very detailed run down of her history. After visiting the Habu Temple we had lunch which was also from a local restaurant and absolutely delicious. We visited the Nile and went on a much needed relaxing boat trip and returned home feeling a shade more knowledgeably and absolutely delighted. A well organised and professional trip. Well worthwhile as a day trip. A good driver and our guide Ayman was both knowledgable informative and friendly. Recommended. Last year we went to Cairo with Egypt Tour Portal Day Trips (our contact is Ahmad Sameer, a very responsive & efficient man) and it was a unique experience. For this reason we used their services again this year but this time for a private day trip to Luxor. It’s a very long day from 05:30 to 19:30 but it’s worth every minute. Special mention to our guide Ahmed: an outstanding person with a huge knowledge of Egyptian history. His French is absolutely perfect and he was very nice and helpful towards our kids throughout the day. I would recommend this person to anyone! Overall a very good day trip which was made better by our very good tour guide Mohammad Husan (sorry if the spelling is wrong). The amount of knowledge that our guide had was very good and the way that he delivered the information was just right for two not so intelligent northerners. It is a long drive to Luxor, approximately 3 to 4 hours. I would recommended this trip to anybody visiting Egypt. Very informative, guide was so nice and stopped to help us out if we were feeling under the weather. Really do recommend this excursion rather than the public one. What an amazing day we’ve spent with Ayman the tour guide and our driver Hassan. Ayman was very knowledgable, kind and willing to respond our numerous questions. Hassan took us for a safe drive from our hotel to Luxor and the whole service was excellent. Alvaro and Cristina. We took the private day tour from Hurghada to Luxor and everything went extremely smoothly from the first contact and reservation (via email) to the tour itself. We would like to thank our driver for the day and our guide (Mohamed Assan) for their support throughout the day. The beauty of the sites (special mention for the Karnak temples) make up for these points, as has done our Egyptologist guide, Mohamed Assan. Mahmood picked us up from our hotel in Soma Bay at 5.30am. We chatted with him on and off most of the way to Luxor and he was also very knowledgeable. The car had air conditioning and was very comfortable. Mahmood made us feel like we could ask anything. Aymann was our guide in Luxor (I hope I spelled that right), he was also extremely good and answered all our questions. Very knowledgeable in Egyptology. With him all the store owners and people who would otherwise have hassled us kept away. All in all, everything felt very safe, the police were watching all the roads and archaeological sites. We went to the Valley of the Kings (three tombs), Hatshepsut temple, a short cruise on the Nile River, Lunch overlooking the Nile, then finally Karnak Temple. We could have done more, but we were getting tired after the early wake up so we called it a day. We really recommend a tour with this company. It was highly enjoyable, we plan to use them again next time we are in Egypt. Go to Egypt- it’s safe, the water in the Red Sea is amazing and the coral is as good as the South Pacific. Our driver for this part of the trip picked us up on time from our hotel in Hurghada. We had a nice drive over the mountains and down to the Nile. We stopped at one rest stop where my kids started to get a better idea of what life was like outside the resort – nice people, but squat toilets for the men and open air convince store/tea shop. Coming into Hurghada we went through an area of palm groves and mud buildings, then into the city, picked up the guide, and went up to the valley of the kings. Our guide recommended which tombs to see, and those were awesome. He also told us Tut’s tomb wasn’t worth the extra, but we traveled all the way to Egypt so we weren’t going to skip it. It was smaller and not as colorful, but we were glad we went, and even more glad a few days later when we saw the treasure that was in the tomb at the museum in Cairo. Afterwards we went to a shop where the had guys that showed the various steps of making alabaster pots, and let the kids take turns trying the various steps. Next was Hatshepsut’s temple – it was nice, though a lot of it is restored/reconstructed. The we went and ate lunch at a rooftop restaurant overlooking the Nile while the driver took the van around, over a bridge to the other side. Then we went down to the river for a short “cruise”/ferry ride along one side, the across to the meet then van. As I read this it’s sounds lame, but it was really quite nice. 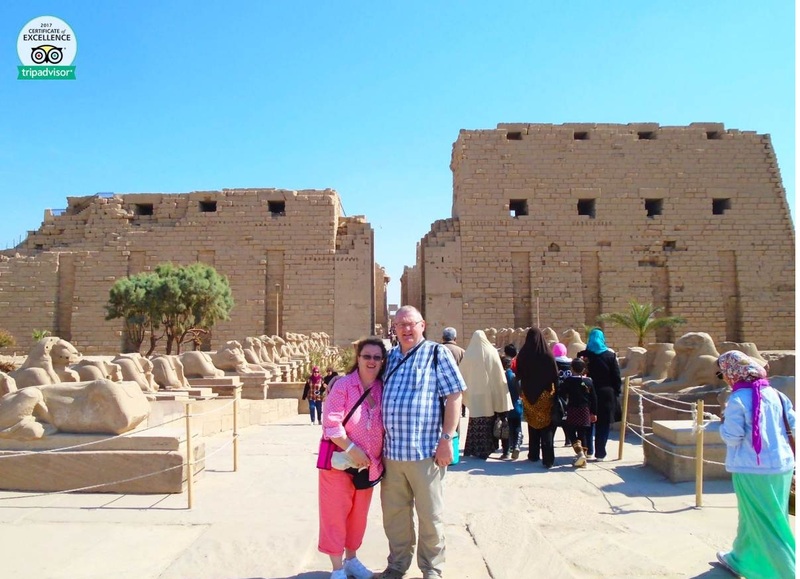 Then after we met the van by the Luxor temple we drove to the large statues for a quick photo op (commonly called the Colossi of Mennon) then to Karnak There we toured part of the temple complex – amazing! Some of the “paint” (really ground stone mixed with an oil base) was still visible on the under side of beams that were out of the sun. Then our driver took us back, with a similar stop enroute. The whole trip the guide gave us a running history lesson, found the souvenirs we wanted, and kept away some of the over pushy sellers we saw other groups get swamped with. Only costs outside of the trip, and Tut’s tomb, was the camera pass in the valley of the kings (worth it! ), souvenirs, drinks at lunch, and snacks at the stops. We dressed pretty conservative, but saw western women in just about every style of clothes. There were lots of Europeans, but I only saw one other American family during during the 10 days we were there. Everyone we met was excited about about having American tourists (dollars) and seemed genuinely glad to meet us. Our guide was Mohammed Hassan, and I’d definitely recommend asking for him. Trip was the first. I recently booked the one day tour from hurghada to luxor. The visit included Valley of Kings (3 tombs, absolutely stunning murals inside and the site is extremely impressive), Hatchepsut temple, Colossi of Memnon, Karnak temple. Lunch was also included (not drinks, but those are cheap), which we had in a good restaurant overlooking the Nile (set menu though). We also visited a local souvenir shop, which you can skip if you don’t wish to do that (better quality articles than in other touristy souvenir shops, but more expensive). Our guide, Mohamed Hassan, was very knowledgeable and provided a good experience by balancing time spent giving us info, and leaving us to visit the sites on our own. Our driver was excellent (long 4 – 4 and half hour drive, but the road is very good, a few checkpoints but cleared expeditiously). Overall, I’d really recommend this tour if you don’t have more than one day to spend in Luxor (that was our case, if not I’d recommend spending at least two full days there). The sites are absolutely amazing, and it would be a shame to miss out on them: as it is, the tour provides a packed but efficiently organised way to do as much as possible in a single day. Overall a great day out, we did struggle with the heat a little. Our guide was very good and very informative. Started out the day very early, we were picked up from our pick up point in a private car with AC (was a blessing), the one downside was that we were not aware how long of a drive it was… 4 hours each way to be exact. We went to the valley of the kings first then out to Hatshepsut temple before we went to a small village shop which showed how they worked the stone and we had the option of buying souvineirs if we wanted to. Our guide helped the transition process through the market halls so we weren’t hounded too much at each temple. We then drove to a nice restaurant near the Nile were we were presented with a buffet style lunch of traditional Egyptian food. After we had a short trip on the Nile. We then moved on to Karnak temple. Overall the day was enjoyable and the guide was very friendly and accommodating. The only thing we didn’t get to do which was supposed to be on the intimacy was a ride in a horse drawn carriage. But it was a long day so we weren’t bothered too much. Our guide was Mohamed Hassan. I wouldn’t really suggest if you have young children as i believe the heat coupled with how long the day was would be too much for them. My wife booked this trip via Egypt Tours Portal. We received an itinerary through and were geared up to go about half way through our holiday when on the morning we were due to go to Luxor, our youngest son woke up with a temperature, headache and coughing his lungs up. With half an hour to go before we were due to be picked up, we contacted Egypt Tours and requested if we could move the trip to a few days away in order to allow our son enough time to recover. Egypt Tours Portal agreed to move it, which was fantastic. So, take two, a few days later and we were picked up at 5.30 ready for the 4 hour drive each way to Luxor. The driving in Egypt can be pretty hairy, but our driver did an excellent job and got us there safely and comfortably (it was a pretty new, air-conditioned vehicle). We picked up our guide, Abdelrahman Ahmed Ali, and headed off for the sights. Our itinerary included The Valley of the Kings, Hatshepsut Temple, Colossi at Memnon, Lunch and Temples of Karnak. Abdel gave us some great guidance on avoiding the sellers at the entrance Bazaar of the Valley – essentially walking at pace through the middle of it! When you get into the valley, it is breathtaking. For me, the natural scenery was more impressive than the tombs themselves, but we obviously wanted to see the tombs and the trip included visiting three tombs. One note – if you want to take photos inside the tombs themselves, you need to purchase an additional ticket not included in the Egypt Tours price, but its not expensive – think it was 300 EP (about £12), and well worth doing. Next was the temple of Hatshepsut – again an awe-inspiring place, surrounded by mountains. This is far more in the open, so make sure you lather on the sun lotion and keep your hat on! We then visited a local stonework workshop & gallery. This wasn’t on the itinerary, but was good fun, and run by some lovely people (and I had mentioned to Abdel that we’d like to pick up some souvenirs). Be warned though, the products are high quality and hand-made, so not cheap (starting at about £30 for anything reasonably sized), and whilst you’re not under any real pressure, my kids’ frowny faces made me cough up more than I had intended spending. If you’re not interested in buying anything, I’d be clear at the start of the trip that you don’t want to do this bit, and save some time. We then visited the Colossi at Memnon, which although on the itinerary, was going to be skipped (think we had spent too long in the stonework shop), but we wanted to see it despite Abdel’s protestations that they were ‘just two destroyed statues’. We didn’t spend much time there, but glad we did – the statues are far more impressive than Abdel’s description. Lunch was next at a decent enough local restaurant, but not with a view of the Nile as described in the itinerary – it was pretty late too, about 3pm, again, probably because we had lingered a bit in other places. One point here is that the drinks were not included in the tour price, but very reasonable, so we weren’t that bothered. Finally, we drove to Karnak, which was literally around the corner, and my favorite part of the trip. The scale of the place is ridiculous – everything is built to a massive scale, and you could probably walk around the place only looking skyward to take in all of the various columns and obelisks. We then drove home, another four hour stint, but again felt very safe with our driver, who was clearly very used to handling not just the traffic, but all of the various checkpoints (get used to driving through bottlenecks manned by armed men – not always in uniform…). I would strongly recommend booking a tour through Egypt Tours Portal – they proved themselves extremely good value, punctual and reliable, and in our case hugely flexible – not least because of our re-arranging the trip at ridiculously short notice, but also during the day. Our itinerary suggested we would get home at about 7, but we didn’t get home till 9, and never felt pressured by either our driver or guide for time. Abdel, our guide, was also great, very friendly and knowledgeable – sometimes went a little quick for our younger kids to follow, but I was confident that he was making sure we got the to see the best highlights of the various sites (you could spend hours at each site if you wanted to see everything). I would advise being really clear about what you do and don’t want on your itinerary, both at time of booking, and once you’ve met up with your guide – there is mention of a boat trip on the Nile on some of the reviews here, that didn’t feature on ours, and would have been a nice addition (perhaps instead of the visit to stonemasons). I’d also be prepared that it will be a long, tiring day. We have three sons, and the youngest two (aged 9 and 10) started to flag at points. I would massively recommend it though – I can’t see the point in going to somewhere as old and as far as Egypt, and then never straying outside of the resort. I can’t sing Portal Tour’s praises high enough, what a joyfull trip to Luxor last week. From the moment we were picked up at 5am by our lovely driver Mahmoud, in his air conditioned car, who even stopped of to buy us some refreshments enroute home. To our lovely, extremely expert guide Asraf who always took his time explaining in detail what you should be looking for when entering tombs, his knowledge was incredable. He dealt with all the tipping throughout the day. We didn’t pay for anything until the end of the day. Asraf made sure we had water/juice. After such an excellent experience I would never book a tour via the hotel rep. 10 out of 10 Portal for a very memberal day out to Al-Deir Al-Bahari Temple, Valley of Kings, River Nile boat trip, Banana Plantation where you sampled the banans and were given water melon, back on boat to a hotel on the River Nile for lunch, then on to Karnak, returning back to the hotel at 18:30. A big Thank you for a enjoyable tour to Luxor. Crazy drivers, 7 stars trip & luxury service for same price as the tour operators! Like everyone else I arranged my trip from Hurghada to Luxor via internet using instinct, luck, untypical recommendations and hope. The result was extremely interesting, emotional and educational. Alsooooo… multicultural. On 19 Dec I got my mail from Sameer with confirmation of my wishes for our private tour and the price. I approved all, price was ok. Basically, the idea was to do what I want, when I want and if I want, choosing from six hotspots, traditional food on my expenses, transport by air-conditioned vehicle. Also I mentioned ‘’without papyrus, alabaster or other shopping ’’. On 3 January at 5 in the morning one new Mitsubishi Lancer and a good English-spoken driver were waiting for us. It was a lot different from classical truck ! Once in Luxor we were introduced to our guide and the next car, one Toyota Hiace only for us and for our tour. Our guide Alaa has adapted quickly enough to our reality. Fluent English, solid knowledge and good availability are some of his goods qualities. He is one of the best Egyptian guys I have seen in the last years. Nobody rushed us, nobody made us to buy things. With a shadow of regrets that we could not visit more, today I can tell it was the best and almost perfect walk inside Egypt. Cannot be compared even jokingly with those organized by tour operators. I noticed the speed of adjustment to a relatively difficult client. Human and logistically speaking. This quality is essential for a successful trip of one customer. I give them ten stars of ten possible. Back to Hurghada we had one new Hyundai and an extremely funny driver. From him I learned that best way to talk with friends about latest news is in the traffic roundabout. Amazing tour guide – Ayman. Quite a funny and considerable guy. Love how he manager or agenda clearly and informed us our next agenda so that we can prepare better to save the hustle. Also love the gift with out names on at the end. As well as very thoughtful of him asking what we would like to eat and arrange them in advance. Over all is a great trip, and leant a lot of history about the heritage. My partner and I returned to Egypt after 3 years for a second time in Sept. On our first trip we had visited Cairo and the great pyramids with Egypt Tours Portal and we were so impressed with our day trip that we decided this time around we would visit Luxor and the Valley of the Kings as it has always been a dream of ours! And it certainly didn’t disappoint!! We were picked up from our hotel in Hurghada at 5am promptly by our personal driver Mohamed and our own private vehicle for the day. While it is a long journey by road to Luxor (4-5hrs) from the get go, we felt very safe with Mohamed. He is an exceptional driver and is certainly well used to the roads! When we arrived in Luxor, around 10am, we picked up our guide Abdelrhman. We began the day by visiting Valley of the Kings. Abdelrhman gave us lots of history and background before we entered each of the tombs. He is very knowledgable and straight away, we felt comfortable and at ease with him. We were able to ask him lots of questions and nothing was too much trouble! The tombs itself were fascinating and trying to take it all in can be quite overwhelming especially when you visit Tutankhamun’s! From here we visited Queen Hatshepsut’s temple which again is truly stunning with an amazing view of Luxor. Abdelrhman once more retold the great stories behind this inspiring queen and was more than happy to take some fun pics of us at the site re-enacting some iconic Egyptian poses!! After this we had a fabulous lunch overlooking the Nile which is included in the price. From here, we took a boat trip across the Nile. I would recommend anyone to do this as its throughly enjoyable. The best was most definitely saved for last! Karnak Temple! WOW is the only word I can use to highlight this site!! It’s awe inspiring and you will be truly left speechless. Once more our guide walked us around the temple and explained the history behind it. We were so engrossed and engaged at all times with Abdelrhman! He is so passionate about his beautiful country’s history. He then gave us some free time to wander around on our own and to take it all in. But not before taking some stunning pics of us within the temple! Karnak Temple was certainly the highlight of this trip for me and to say I’ve been there is so wonderful! I am so blown away with Egyptian history and the knowledge which Abdelrhman imparted on us. I want to also express that if some people are a little apprehensive about visiting Luxor or indeed Egypt, please please trust in that I say, at no time did we feel unsafe on either of our 2 trips. The hospitality, friendliness and warmth of the Egyptian people is so evident and they are so pleased to see you visit their country. We cannot recommend Egypt Tours Portal enough or more importantly our guide Abdelrhman and not forgetting our driver Mohamed. We will 100% return to Egypt in the foreseeable future and most definitely take another tour with these guys! It’s such a professional, efficient run company with everything taken care of so you don’t need to worry about a thing Luxor you are truly magical!! Until next time Egypt……. A first-class thoroughly professional trip with a very personal touch. Although we based ourselves in Hurghada, our aim was to see the antiquities of Egypt. So we pre-booked via email a 2-day, 1-overnight private trip to Luxor and Abu Simbel with Egypt Tours Portal – and we could not have been more pleased. We were picked up by car outside our Hurghada hotel at exactly the time we had agreed weeks earlier and met our tour guide, Mohammed Hasan (an Egyptology graduate with many years of tour guiding experience), on arrival in Luxor. He told us a lot about the history and culture of ancient Egypt and this provided context for our visits, with excellent detailed explanations by Mohammed, to the Valley of the Kings, the Temples of Hatshepsut and Karnak, and the Colossi of Memnon. After tranquilly crossing the Nile by boat, it was on by train to Aswan where our first day ended after midnight in a very comfortable hotel. Next morning by car to Abu Simbel, with Mohammed again a great source of information, before the long haul by car, train and another car back to Hurghada. The antiquities of ancient Egypt are wonderous – but it was Egypt Tours Portal and Mohammed Hasan that made our visit to them such an enjoyable experience. Everything went according plan, no hitches, no problems. The drivers were punctual, safe and courteous; the cars modern, scrupulously clean and comfortable. The included lunches on both days were top-quality food in top-quality restaurants. Mohammed was not only and excellent guide but also an excellent host – we had the feeling that we were constantly looked after. And we didn’t pay a thing until just before we parted company with him on our return journey – when we were asked for exactly what we’d been quoted when we booked by email. If Egyptian antiquities are on your bucket list, we strongly recommend you contact Egypt Tours Portal. No hesitation in awarding them five stars. Private Tour: Luxor Day Trip. From Hurghada, Including Valley of the Kings, Hatshepsut Temple and Karnak Temple. We were collected from the main entrance to the Hotel Complex very promptly at 5am. Our driver was a most charming man who was surprisingly cheerful at that time of the morning. We were settled into a very comfortable and immaculately clean, air-conditioned car. We set off promptly as we had some 250 km to travel. I regret that I cannot recall our driver’s name, so my humble apologies to him. He was very informative about Egypt and the local area. Throughout our journey he pointed out lots of landmarks, told us about the cultivation as the countryside changed from arid desert sands to the lush green of the Nile Valley. It was a great journey, although long. My companion was able to catch up on some sleep. On arrival at the Valley of the Kings we were met by our Egyptologist Guide Ahmed. He was a local man who looked after us, together with our driver throughout the day. Ahmed had excellent English and was very informative about this fantastic archaeological site. He told us how the tombs had been constructed, plastered and decorated. He also explained when and how all, but one, of the tombs had been robbed over the millennia since they were constructed. When you buy a ticket to this site you can visit three of the tombs, this at first seemed rather few but our guide recommended three that he believed were the best to visit. He chose for us the tombs of Ramesses III, Ramesses IV and Ramesses IX. They were all completely stunning. The state of preservation was far beyond our expectations. Sadly, cameras are not allowed thou many tourists were taking photos on cameras and phones. I was tempted to do the same but feel that just because some tourists break the rules, doesn’t mean we all should. Our guide purchased for us a guide book and a set of post cards and a couple of DVDs of photographs. All are excellent and made up for my disappointment at not being able to take my own. Thank you. We were also able to purchase a ticket to visit the tomb of Tutankhamun. This was, for me, the highlight of the tour. I have wanted to visit this site for over 50 years, We were even more excited to find that the child king was in residence. Thank you to our guide for making this first part so exciting and for giving us a great understanding of exactly what we were visiting. He had a good knowledge of the history anmd the sites. He was most helpful in answering any questions that we had. Our next visit was to Hatshepsut Temple. This is an amazing construction, built into a cliff. It is in a pretty good state of repair and again, here we aere given a very full history of this iconic temple. We were allowed to take our own time to explore the temple for about 30 minutes. We then were taken to a small jetty on the Nile and spent about an hour sailing the Nile in a felucca. This was a very realxing and pleasant experience which was great fun. This is an absolute must for anyone paying a visit to this enormous and beautiful river. We followed up with a traditional Egyptian meal. This was at a very Egyptian restaurant. The food was plentiful with a reasonable choice of courses. We both enjoyed this. Our guide allowed us time to eat an unhurried meal, though the service for coffee could have been a lotb quicker. I would like to thank our guide, Abdelrhaman Ahmned Ali. It was a great day, very informative and we were very well looked after throughout the day. I would thoroughly recommend this lovely man as a guide to these site. Thank you! I would also like to thank our driver. If you are travelling to Egypt & want to enrich your lives by walking in the steps of the ancient kings & queens – this is for you! We were picked up in a spotless brand new mini van at 5.30am by the most polite & curteous driver who made us feel safe & our comfort was paramount. Halfway to Luxor we stopped at a cafe for a comfort break which was an experience…in a good way. We arrived at Luxor & met our guide Hagar Hatata – wow what a lady! If you book, I totally recommend asking for her. She was amazing, knowledgable, friendly & very attentive to our needs – a delight to spend the day with. The best part of a private tour is going at your own pace & really delve into the fascinating history of this place, it’s very spiritual & difficult to put into words how impressive the sights are. Good to see the contrast of ancient & new…we started at Valley of the kings, then Hatshepsut Temple, then colossi of memnon & ate lunch at a local Egyptian restaurant which was clean & served delicious food (no tummy problems at all..!) from there we took a private boat & sailed across the beautiful waters of the Nile to Luxor & Karnak temple. Stunning. And being a movie buff I was excited to see the location where James Bond was filmed! So back to the wonder of the ancient Egyptians. We were lucky enough to see spectacles which have been closed to many visitors for several decades so the gods were certainly smiling on us. I encourage you to pay the extra & book with this team, one of the best days we have ever had! Thanks to Hagar again. This trip was spectacular and completely professional. The company picked us up from our hotel in Hurghada and drove us to Luxor where we met our completely competent tour guide, Mohammed. The attractions were amazing and Mohammed explained everything so eloquently and clear, and often left us to “alone time” so we can explore a little with ourselves to gain an emotional connection. Mohammed met all of our demands, including our amazing Vegan lunch on the Nile. We highly recommend this company for day trips and would recommend even higher to request for Mohammed Hassan as a tour guide. Great trip with great memories, thank you Egypt. We really enjoy time with Mohamed hassan. He shows us everything important and some hidden spots. I can really recommend him. I was a single travelleir going from Hurghada to Luxor on an overnight trip. I booked the trip with this company and I was very satisfied with the level of service and they were very flexible as I had a change to the normal programme. I also think the price for the trip was very reasonable compared to some of the other touroperator´s prices. The hotel in Luxor was an amazing 5 star hotel next to the Nile. The private driver was on time and did everything he could to make the long trip to Luxor as comfortable as possible. In Luxor I was greeted by the Local guide Haytham (Sam) who was a very nice friendly and knowledgeable guide. He also did everything he could the make the experience as wonderful as possible. His English was very good. The Luxor programme was very good, intensive and interesting. The food and restaurants were good as well. I would use this company again if I ever went back to Egypt. Long day but well worth it. Can’t come to Egypt and not see Luxor. Way more to see here than Cairo. Very informative guide who could tell us everything, and answered all our questions. As well as taking us around and trying to avoid the crowds! Would suggest taking a private journey as can work the day to your own time and spend more time where u want to without worrying about crowds slowing you down. EXCELLENT value for money. Shows you the very best of Luxor without being out too long. Very friendly driver, good day. From booking the trip to returning to the hotel it was carried out in a friendly professional manner. I had enquired about the trip before my holiday and booked it whilst in Egypt. My emails were replied to quickly and were detailed and informative. So glad I did, it was an incredible day. The day started early at 5:30 am and our driver was waiting for us in a private car which he clearly looks after. He was very polite, answered our questions and an excellent driver considering the traffic in Luxor. We met Sam, our guide, enroute who immediately started to tell us about our day ahead. What Sam doesn’t know about Egyptian history isn’t worth knowing. He was very friendly and there was no hurry, we saw everything in the Valley of the Kings and the Karnack Temples. It may seem expensive for a day out but apart from paying extra to see King Tut (a must really) there was no other outlay. Sam saw to all the general tipping including the tip for using the loo. We stopped for lunch along the Nile which was good and filling, plenty to eat. Everyone involved in our day out was friendly, the boatman even turned around to retrieve my hat when it blew off during the ride on the Nile. We dropped Sam off at the end of the day and we nodded off going back to the hotel confident in our driver’s ability to return us safely. It is a long day and we went through quite a few checkpoints along the way which made us feel a lot safer travelling around Egypt. I would highly recommend you try the day out to Luxor. I cannot fault the service of this company. It was truly an amazing day and we have the photos to prove it. We had an amazing time on our day tour from Hurghada to Luxor with our guide Mohammed Hasen. We were picked up from our hotel in Hurghada and drove 3.5 hours to Luxor where we were greeted by Mohammed. He was very friendly & informative. The restaurant that was included with the tour called “Africa” was absolutely amazing! This package was well worth it and I would definitely recommend it to others! I pre-booked a day trip for my boyfriend and I from Hurghada to Luxor before we left the UK for our week stay in November. It was very expensive at £100pp, but we felt that we wanted to explore some of Egypt during our stay, so it was worth it for a one off. We were picked up from our hotel at 5.30am on the dot and driven to Luxor to meet our guide. Both our driver and guide were very friendly and knowledgable which made it a very nice day out. We usually prefer to be in a slightly bigger tour group, but this private tour didn’t feel awkward at all. Naturally, we only had short stops at each location, but with a 4 hour drive each way, this was expected. Lunch was lovely at a little restaurant in Luxor that I believe was called Africa. We were offered a choice of dishes which were brought to us on our arrival. It was really tasty food, and we had a great view over the river while we ate. The only downside was having to pay for our own drinks. When a tour costs so much money, I think it would of been nice to include a non-alcoholic drink each. That’s just a small gripe as the rest of the tour was perfect. I highly recommend booking a trip with Egypt Tours Portal, and if we ever return I wouldn’t hesitate to use them again. During our stay in Hurghada my daughter and I booked a one day tour to Luxor with this company and can highly recommend them. The 3.5 hour drive to Luxor starting at 5.30 a.m. although long, was interesting for us as this was our first visit to Egypt, and our visits to the Tomb of the Kings, Hapshetsut temple, Colossi of Memnon and Karnak were amazing. Walking about in the heat was a little tiring, so a trip when the temperatures are a little lower would be even better. Obviously we would have liked more time, but this was an excellent “taster” trip and included a lovely lunch overlooking the Nile – it was a shame we could not eat it all, but we both have small appetites. Our guide Mohammed? was very good, enthusiastic and kept us well informed, and our driver (although a very fast driver at times!) was experienced at anticipating the erratic driving of the Egyptians and avoiding the many obstacles particularly on the way back, (donkeys and over-loaded carts, packed mini vans, motorbikes, cars and people who would suddenly make right or left turns without warning). It was certainly interesting! As mentioned in other reviews, the guides at the various archaeological sites can be very pushy and you cannot walk around in peace or stop for a few minutes without being urged to follow them to take a particular photo or go with them to look at something of note (for a small tip) which is a shame, but this is something we were aware of and we tried to be firm but polite with them and also ignore the many persistent sellers of postcards etc. before we boarded the boat for our trip across the Nile. The boat trip made a nice change, and overall we had an excellent day out with part of the return journey from Luxor taking a different route which also made it more interesting for us. It was a shame to see so few tourists at all of the sites, and we can only say to potential travellers, do make the effort to do these trips and visit, they are so worthwhile and we felt perfectly safe the whole time, particularly with the numerous vehicle check points throughout the journey. The only point we would make is we were not expecting to be taken to the alabaster factory (which we would expect to be included on the larger tour bus itineraries only) as this is not mentioned on the website, and although it was informative and there was no pressure to buy, and we didn’t, it was obviously expected that we would, and this time could have been better spent at the various sites. A nice touch was the phone call towards the end of the trip to ask if everything was fine. Also an English speaking driver would have been appreciated, as it would have been nice to find out a little more about the country and life there on our long drive to Luxor, but this is a minor point really. Thank you for making this day a memorable one. Took a day trip from Hurghada to Luxor with my girlfriend in July and the day was fantastic. It was very well organised and ran smoothly. The tour guide was very knowledgeable and answered all questions fully with enthusiasm and assurance. Fitted many sites into the day including the temple of Karnak, Valley of the Kings, Hatshepsut temple and a boat trip on the Nile. I would recommend this great tour to anyone. I was there and it was very beautiful. The people, the hotel and the sightseeing assistents are very awesome. I would recommend to do the trip. You gonna have a lot of fun. When I have the chance to visit it a second time i would do it! I took the chance while in Hurghada to visit Luxor and see the amazing sights of ancient Egypt. There were some cheaper tours on offer but the chance to be on your own with a private air conditioned car and your own Egyptologist was not to be missed!! It was an early start at 05.30 and it was advertised as a 3 1/2 hour drive but with all the police checkpoints it was more like 4 1/2 but this is not the fault of the tour company!! My guide Mohammed was a lecturer at the university and he was so polite and knowledgeable he couldn’t do enough for me!! The whole day was amazing and very very safe.